I found this recipe a few years back in the October/November publication of Cooking Light Magazine. It had a little bit too much “spice” for me, but other than that, the bagels were delicious and much healthier than normal bagels. I’m publishing the recipe exactly as it was published in the magazine, but be aware I cut back on the allspice, clove and nutmeg. I also don’t use a bread machine, I make my dough in a kitchen aide mixer with a dough hook. In bread machine pan, place 2/3 cup water, pumpkin, brown sugar, salt, spices, flour and yeast in order suggested by manufacturer. Select dough setting (check dough after 5 minutes of mixing; add 1 to 2 tablespoons of water or flour if needed). When cycle is completed, turn dough onto a lightly floured surface. Shape into nine balls. Push thumb through centers to form a 1-in. hole. Stretch and shape dough to form an even ring. Cover and let rest for 10 minutes; flatten rings slightly. Fill a Dutch oven two-thirds full with water; bring to a boil. 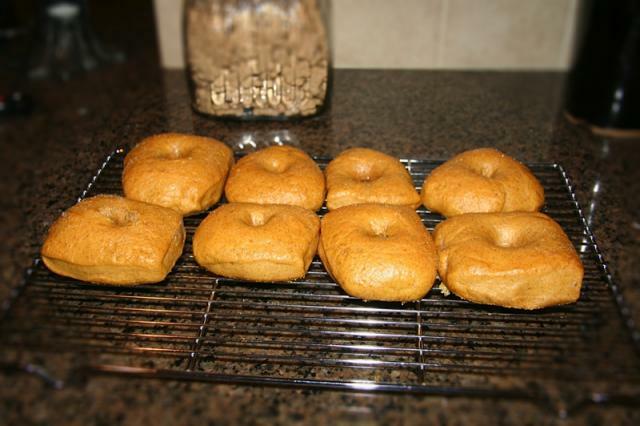 Drop bagels, two at a time, into boiling water. Cook for 45 seconds; turn and cook 45 seconds longer. Remove with a slotted spoon; drain on paper towels. Whisk egg white and remaining water; brush over bagels. Coat a baking sheet with cooking spray and sprinkle with cornmeal. Place bagels 2 in. apart on prepared pan. Bake at 400° for 15-20 minutes or until golden brown. Remove to wire racks to cool. Yields 9 servings. 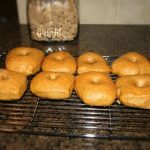 1 bagel equals 180 calories, trace fat (trace saturated fat), 0 cholesterol, 273 mg sodium, 40 g carbohydrate, 2 g fiber, 6 g protein.